This is my favourite lunch, especially on Slimming World. It’s Syn-less, it’s a great way of using up leftover vegetables from the kitchen and it gives you a load of different veg in it. 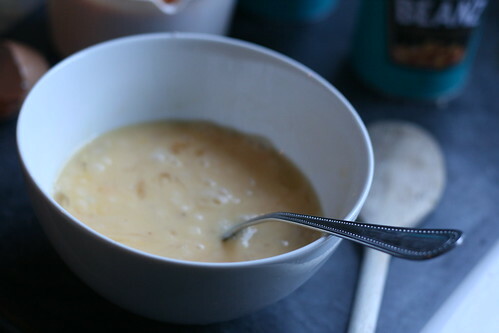 Plus it’s bloody tasty and yummy — I used to make this even when I wasn’t dieting. I made it by accident, when I was trying to make an omelette and flipped it wrong. It broke into separate pieces so I ended up just cooking it like scrambled egg. I’ve not had omelette since because this is MUCH nicer. On a completely urelated note, I found my tripod and bought a new remote for my camera so I’ve tried it out whilst taking these photos. They look pretty good — I’m pleased with myself for them. ANYWAY. It’s hard to say the ingredients for this. 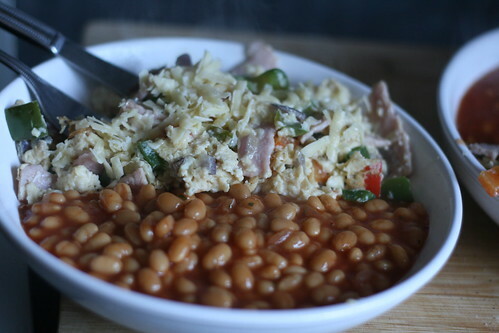 All that’s necessary is eggs and baked beans; the rest you can do with what you want. I’ll just put what I used for this particular one, which is what I usually have with my Eggy Mess because it’s my favourite. 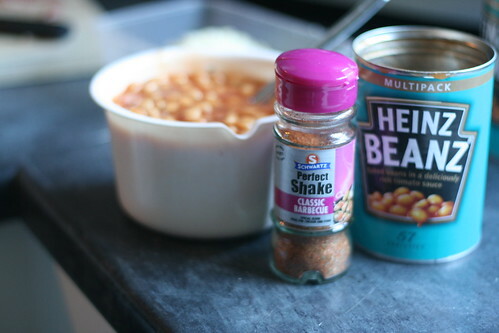 1/2 can to 1 can of baked beans. That’s what I used, but like I said you can use what you want. 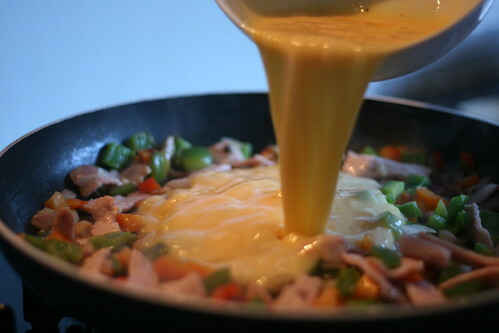 A good rule of thumb is to imagine what you’d put in the world’s tastiest omelette, and then use that. So. Start by preparing everything, because when it starts cooking it’s all over in a flash. 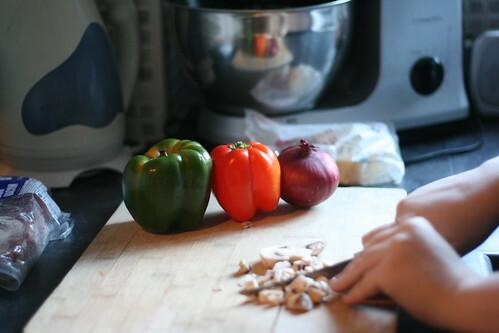 Chop up any vegetables you have into small chunks. Not so small you don’t have to chew them, but small enough so that you can put them in your mouth at once with lots of other veg and don’t have to bite them into smaller pieces. 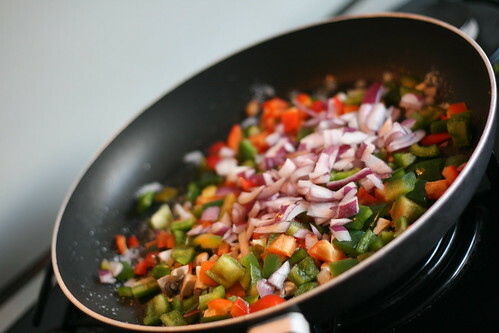 Spray a large frying pan well with Fry-Light and put the vegetables in there but don’t start to cook them just yet. 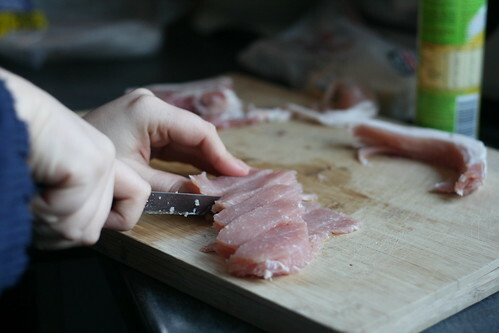 Trim all the fat off your bacon. And I mean all of it. You don’t need it to improve the taste of this and it’s better for you without fat. If you’re using cheese, grate it (there’s a lot of cheese here because I was making this for Mum and myself) If you’re using the Laughing Cow squares, cut it into 9 little chunks with 4 cuts as though you were drawing a noughts and crosses board. Pour your beans into a bowl to cook ready, and stir in some barbecue spices. Obviously don’t make them so hot you can’t eat them because you don’t like it, but the spicier the better. Finally, take your eggs, crack them into a bowl, add pepper and then use a fork to whisk them together well. At this point you’re ready to start cooking. 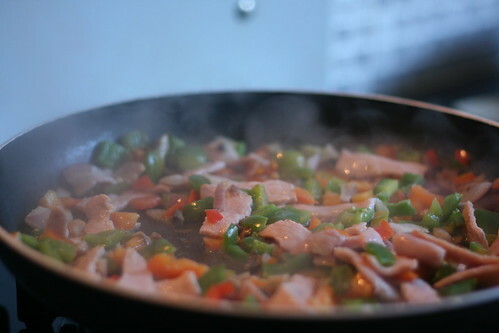 Turn the heat on underneath the frying pan and cook the vegetables for a few minutes. 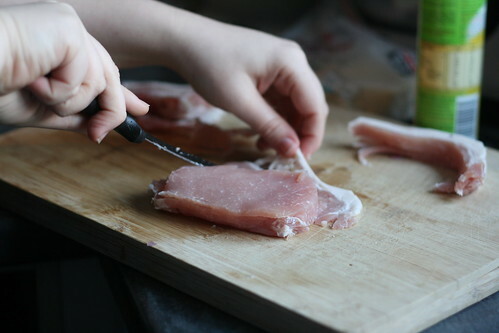 Then add the bacon strips and cook until they’re a nice, darker pink. Pretty much until they’re almost cook. At this point it’s all systems go. Put your beans in the microwave and set them to cook for three minutes. 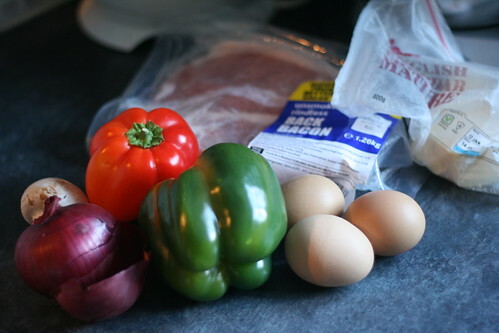 As soon as you’ve done that, pour the eggs on top of the bacon and the vegetables. Count to ten after you’ve poured it in, then sprinkle on 3/4 of the cheese (or mix in ALL of the little Laughing Cow squares) and stir. 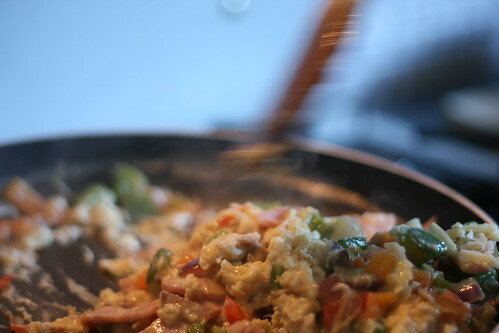 Imagine you’re making scrambled eggs; keep the mix moving, scrape the bottom so it doesn’t stick, everything. As soon as the eggs are edibley done — literally as soon — turn the heat off under the pan and stir again for another 10 seconds or so. It should be ready after that — handily, about the same time as your beans. 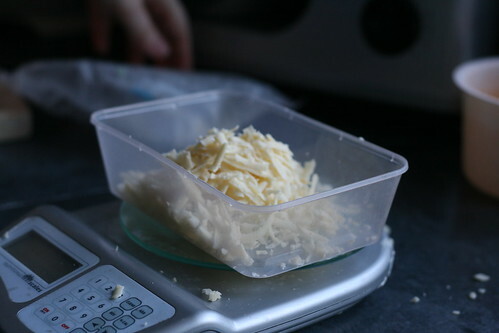 Pour both into a bowl, sprinkle the remaining cheese on top, have some salad in a little separate bowl, and devour. There’s a Flickr Photoset here. Have fun experimenting with different things to put in this — I literally only added cheese last week and the BBQ sprinkles on Wednesday; I’m always finding new ways to make it taste yummy.